Inoculation with nitrogen-fixing bacteria (Bradyrhizobium) is an indispensable technology to increase the productivity of the soybean crop. The objective of this study was to evaluate the viability of the inoculation with Bradyrizobium bacteria associated with the osmoprotector coating on different pre-sowing days and the effect of different soil pH on the components of yield, nodulation and grain yield of soybean. Two soybean cultivars were used, sown in two seasons and submitted to soil pH of 5.3 and 6.5. The seeds were inoculated at different pre-sowin periods with Bradyrizobium bacteria in the presence or absence of osmoprotectants. In the cultivar NA 5909RG (pH 5.3), the seeds inoculated with Bradyrhizobium and osmoprotector, at four and seven days of pre-sowing, presented an increase of 10.8% and 8.3% of productivity, in relation to those without osmoprotector. The osmoprotector and the inoculation of Bradyrhizobium increases the number and dry mass of nodules in soil with more acidic pH. The soil of lower acidity is responsible for higher grain yield, compared to the higher acidity, when both were not inoculated. The variable with the greatest explanatory power and contribution in the variability in the data of the experiment is the grain yield. Glycine max; nitrogen biological fixation; early inoculation. Albareda, M., Rodríguez-Navarro, D. N., & Temprano, F. J. (2009). Use of Sinorhizobium (Ensifer) fredii for soybean inoculants in south Spain. 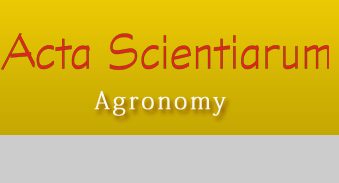 European Journal of Agronomy, 30(3), 205-211. DOI: org/10.1016/j.eja.2008.10.002. Annapurna, K. (2005). Bradyrhizobium japonicum: survival and nodulation of soybean as influenced by fungicide treatment. Indian Journal of Microbiology, 45(4), 305-307. Comissão de Química e Fertilidade do Solo [CQFS]. (2016). Manual de calagem e adubação para os Estados do Rio Grande do Sul e de Santa Catarina (11a ed.). Porto Alegre, RS: Sociedade Brasileira de Ciência do Solo, Núcleo Regional Sul, Comissão de Química e Fertilidade do Solo-RS/SC. Conceição, G. M., Barbieri, A. P. P., Lúcio, A. D. C., Martin, T. N., Mertz, L. M., Mattioni, N. M., & Lorentz, L. H. (2014). Desempenho de plântulas e produtividade de soja submetida a diferentes tratamentos químicos nas sementes. Bioscience Journal, 30(6), 1711-1720. Deaker, R., Roughley, R. J., & Kennedy, I. R. (2007). Desiccation tolerance of rhizobia when protected by synthetic polymers. Soil Biology and Biochemistry, 39(2), 573-580. DOI: org/10.1016/j.soilbio.2006.09.005. Empresa Brasileira de Pesquisa Agropecuária [EMBRAPA]. (2013). Sistema brasileiro de classificação de solos (3a ed.). Brasília, DF: Embrapa. Empresa Brasileira de Pesquisa Agropecuária [EMBRAPA]. (2014). Indicações técnicas para a cultura da soja no Rio Grande do Sul e em Santa Catarina, safras 2014/2015 e 2015/2016. Pelotas, RS: Embrapa Clima Temperado. España, M., Cabrera-Bisbal, E., & López, M. (2006). Study of nitrogen fixation by tropical legumes in acid soil from Venezuelan savannas using 15N. Interciencia, 31(3), 197-201. Fehr, W. R., & Caviness, C. E. (1977). Stages of soybean development. Ames, US: Iowa State University. (Special Report, 80). Hungria, M., Campo, R. J., & Mendes, I. C. (2007). A importância do processo de fixação biológica do nitrogênio para a cultura da soja: componente essencial para a competitividade do produto brasileiro. Londrina, PR: Embrapa Soja. Jordan, D. C. (1984). Family III. Rhizobiaceae Conn 1938, 321AL. In N. R Krieg, & J. G. Holt (Ed. ), Bergey’s manual of systematic bacteriology (p. 234–254). Baltimore, MA: Willians & Wilkins. Rufini, M., Ferreira, P. A. A., Soares, B. L., Oliveira, D. P., Andrade, M. J. B., & Souza Moreira, F. M. (2011). Simbiose de bactérias fixadoras de nitrogênio com feijoeiro-comum em diferentes valores de pH. Pesquisa Agropecuária Brasileira, 46(1), 81-88. DOI: org/10.1590/S0100-204X2011000100011. Taiz, L., & Zeiger, E. (2016). Fisiologia vegetal (6a ed.). Porto Alegre, RS: Artmed.